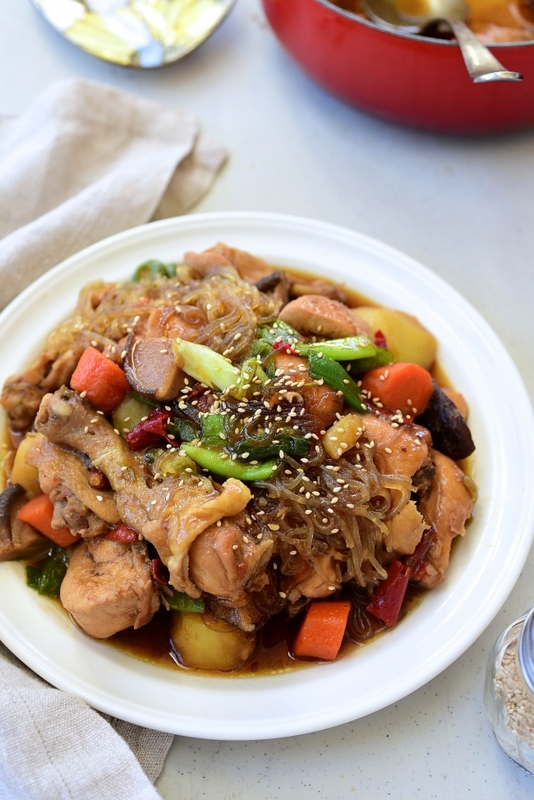 Here’s how to make a hearty, flavorful Korean braised chicken dish, called jjimdak! It’s very easy to make at home with a few basic ingredients! Simply omit the chili peppers for a mild version. 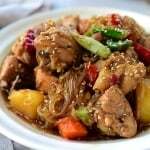 Jjimdak (찜닭) is a braised chicken dish. 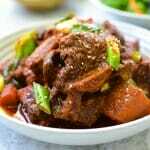 Jjim generally refers to dishes that are steamed, stewed or braised in a sauce, and dak means chicken. These two syllables can be reversed, so jjimdak is also called dakjjim (닭찜). A popular spicy version is known as Andong jjimdak (안동찜닭). It’s a huge restaurant favorite that’s easy to make at home with a few basic ingredients! 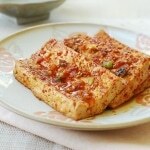 This Andong-style jjimdak recipe was originally posted in February 2011. I’ve updated it here with an improved recipe, more information, and new photos. 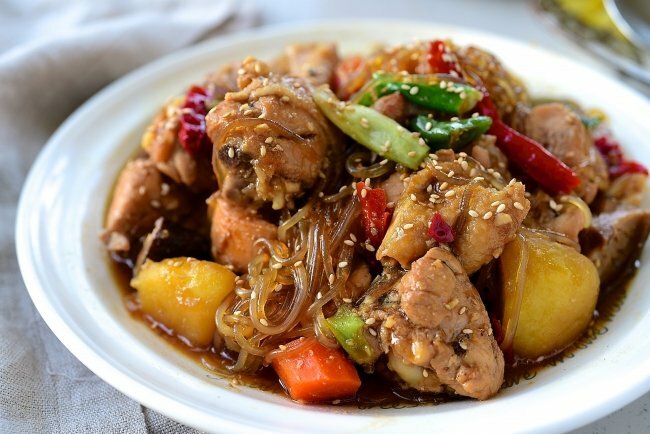 Andong jjimdak, which originated from the city of Andong, is a spicy braised chicken dish that has become enormously popular since the late 1990’s. 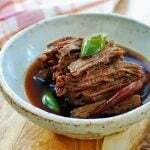 Braised in a sweet and savory braising liquid, the dish gets its nicely clean spicy kick from dried whole red chili peppers and fresh hot chili peppers. Unlike dakbokkeumtang (also called dakdoritang), no gochujang (Korean red chili pepper paste) or gochugaru (Korean red chili flakes) is used! Making Andong jjimdak is relatively simple. The dish uses small chicken pieces and is cooked over high heat. As such, it cooks up pretty quickly. 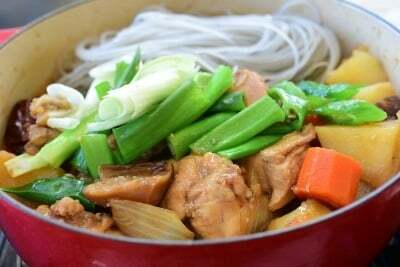 In Korea, braised chicken dishes are usually made with a whole chicken cut up, but you can use pre-cut parts if you want. However, for this dish, you’ll still need to cut the chicken parts into smaller pieces. You can reduce the amount of chili peppers or omit them entirely to make a mild version. This reminds me of the braised chicken dish I grew up eating. When I was a small child, my parents raised a few chickens in our backyard. I remember feeding baby chicks and watching them grow. It was utterly fascinating to see a mother hen lay her eggs. They were great company and provided us with warm fresh eggs every day. Occasionally, some of their lives were cut short by my father who had to do the unpleasant job to feed his family. These events apparently stirred strong emotions in one of my brothers. To this day, he does not eat chicken. As for me, I loved the sweet and savory braised chicken dish my mother used to make. 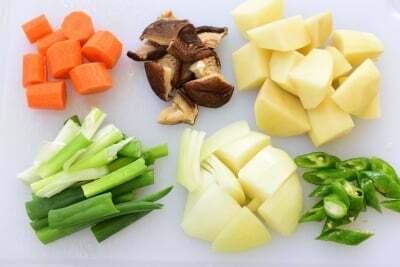 For vegetables, I used potatoes, carrot, onion, mushrooms, and scallions. Green cabbage is another common ingredient for this dish. Some people also add a little bit of leafy greens such as spinach and bok choy. If you care about the color of the dish and want it to be as dark as the restaurant’s version you might have had in Korea, you can add a tablespoon of instant coffee powder, some caramel sauce or dark soy sauce if you have it. 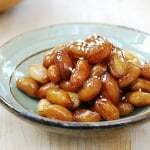 Have you tried this jjimdak recipe? Please rate the recipe below by either clicking the stars or leaving a comment! And make sure to share your creations by tagging me on Instagram! Stay in touch by following me on Pinterest, Twitter, Facebook, and Instagram. 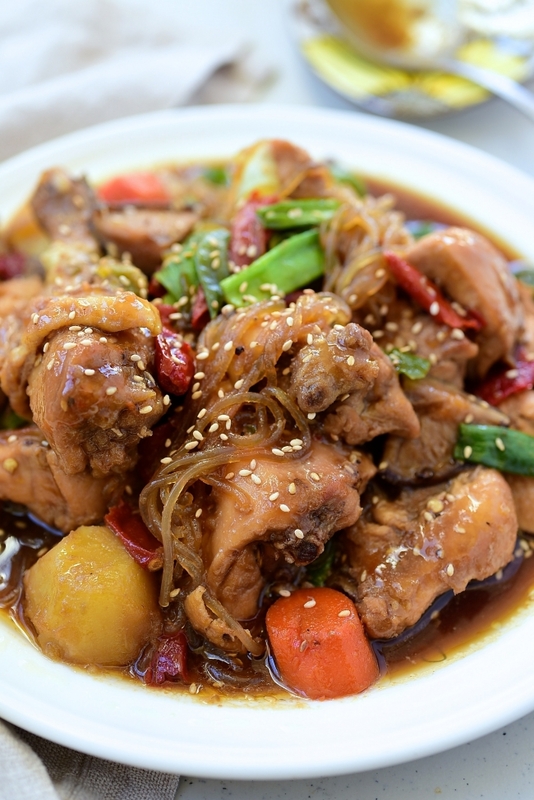 Here’s how to make a hearty, flavorful Korean braised chicken dish, jjimdak! It's very easy to make at home with a few basic ingredients! Simply omit the chili peppers for a mild version. 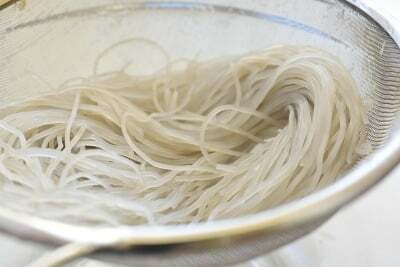 Soak the starch noodles in warm water for about 30 minutes while preparing the other ingredients. Drain well before using. Clean the chicken and cut into small pieces. Trim off excess fat. Cut the potatoes in chunks (about 1-1/2 inch) and soak them in water while preparing the other vegetables. Cut the carrot, mushrooms, and onion into bite-sized pieces. 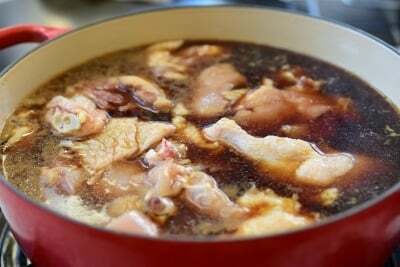 Add the chicken pieces to a large pot. Pour 3 cups of water over the chicken. (You should reduce the amount of water if not using the noodles.) Add the sauce ingredients except sesame oil and seeds. Bring it to a boil over high heat, uncovered, and continue to boil for about 10 minutes. Skim off the foam. 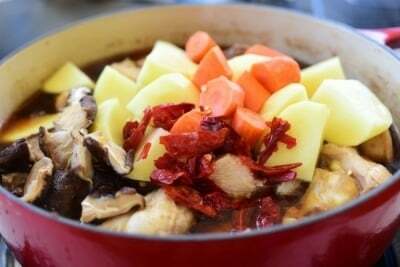 Add the potatoes, carrot, mushrooms, onion, dried whole red chili peppers if using, garlic and ginger. Cover, and cook for 8 to 10 minutes. You may see that there still is a lot of liquid, but the potatoes and starch noodles will soak up a lot of the liquid. Gently mix in the green chili peppers (or jalapenos), scallions and starch noodles, and continue to cook, uncovered this time, for an additional 3 minutes. Stir in the sesame oil. Garnish with the sesame seeds to serve. You can prepare ahead of time up to step 5. When ready to serve, bring it to a boil and do the final step. Yum!It’s been a long time since I had this. My mum rarely makes this. I don’t really know how to make this. So it has no gochujang or kochukaru? Pierre – It’s very easy to make. Try it. There is a variety of jjimdak that uses gochujang and/or gochugaru, and I make that sometimes too. 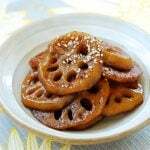 However, this particular version (Andong-style) typically doesn’t call for gochuhjang or gochugaru. Having said that, you can always modify the recipe to add the ingredients you like. If you decide to use gochujang, reduce the amount of soy sauce since gochujang is already seasoned. Thanks. This chicken dish looks absolutely amazing. I must try some Korean recipes one of these days! This dish looks fabulous!! I’m going to put it in my line-up of things to make over the next couple months. Thanks for your easy explanation of the steps! My mom grew-up with a few chickens in her backyard too. She was responsible for feeding them. Although she eats chicken, unlike your brother, to this day, she is very afraid of getting near chickens, turkeys, ostriches, and any type of bird for that matter. She freaks out if one starts walking towards her. As for your braised chicken, it looks great and absolutely perfect for a cold stormy day! Thank you for your kind comment on my blog. I love your fabulous chicken dish, and the yummy sauce that goes with it. Bookmarking it, to try! As a matter of fact, as I was browsing through your other recipes, love, love, all the others that I’ve seen so far. I’m staying close to your blog, and following you, I invite you to do the same! what a wonderful blend of flavors!! I should make this at school for my girls, I know they would love it and Your images are beautiful! Thank you for sharing all of your wonderful recipes. This particular recipe looks so comforting. I will definitely put it on my list for this week. 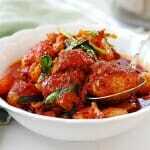 This chicken stew looks so appetizing and delicious! We are having another extremely cold spell here. I am sure this dish will warm up both the tummy and soul. Everything looks so colorful, vibrant and oozing with life! 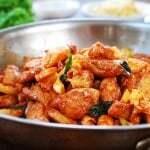 I love Korean chicken dishes. And yours looks fabulous. How cool you had chickens growing up. I bet it was extremely tasty making fresh chicken dishes. Just finished making this and it’s awesome! I tried other recipes but this one is perfect. Thank you for sharing. That’s great! Thanks for letting me know. It means a lot to me. Love your blog! Do you think it would turn out okay if this was done in a crock pot? Tks! It will be great in a crock pot. You would not need the water in the recipe for slow cooking. Let me know how it turns out. Thank you! Happy cooking! Thank you for having this available on the internet! Your instructions are straight forward and very easy to follow. Absolutely love making this. Makes for a very enjoyable dinner! You’re welcome, Mag! I’m thrilled to hear you love making this. Thanks for letting me know. I make this quite often as well. A family favorite! This was just beautiful! I substituted honey for corn syrup (I can’t find corn syrup where I live) and I don’t think it changed it by much. I’ve never had the starch noodles before and they were gorgeous. I served some of the sauce and chicken with rice for my picky child and she loved it. That’s awesome!! Happy to hear that. A good call to use honey. I often use honey in my brasied dishes. Thanks for the feedback! Thank you for sharing this recipe! I lived in Korea for 2 semesters of academic exchange and I fell in love with this dish while I was there. Yesterday I cooked it and my whole family loved it! I substituted Chinese cooking wine for soju and honey for corn syrup. You’re welcome! I’m thrilled to hear your family loved it! I bet you had a great time in Korea and made lots of fond memories of food, people and culture. Thanks for stopping by and leaving me the feedback! Thank you for this amazing recipe! I made this last night for dinner and it was incredible. My husband absolutely loved it. The flavours combine together so well – and the level of spice is perfect. The combination is addictive! I needed to add more water- I think too much cooked off when I was skimming the foam initially. I also couldn’t find cellophane noodles here in Abu Dhabi, so I didn’t use any. However, we found that the potatoes in the dish made it hearty enough (I used one very large potato). I also did not have jalapeños, so I used 5 red chilis (the small thai chilis). Thanks again – can’t wait to try more of your recipes! Aww that’s great to hear! Especially all the way from Abu Dhabi! Thanks for trying my recipe and letting me know how you and your husband liked it. Cheers! OMG, this was wonderful and super easy to make! I used bone-in skin on chicken thighs and wow!! I had Korean rice syrup so used that instead of corn syrup and apparently we don’t have scallions here in Manila so I used leeks instead. My husband and 2 boys loved it! Thank you. So happy to hear that! Thanks for letting me know. We cooked this today 🙂 the vegetables were doubled, but it was still so simple to make, yet the flavors are absolutely wonderful! Thank you for this recipe! I am happy to hear it turned out well for you. I am sure all those extra vegetables were delicious! I lived in korea for 3 years and i LOVED jjimdak … this recipe was really good! much better than the one i tried last week. However every time i make it it seems the sauce isnt as thick as when i had it in korea. Do you think I need to add more corn syrup? I used agave syrup instead of corn syrup.. maybe i will use corn syrup next time! any suggestions to make the sauce a bit thicker? Thank you! I am glad it turned out well for you. No, adding more corn syrup will not help. It may make it too sweet. You can try to add a little more starch such as potatoes or starch noodles or simmer a little longer. You can also use a little bit of corn starch slurry at the end. Thank you for this recipe!!! I made it tonight and it was a HUGE hit and your recipes always impress my Korean mom. Hi Karen – Good to hear from you again! Wow you’re planning for Easter already? Nice! And thank you very much for picking this recipe for you special Easter weekend meal! Early Happy Easter to you and your family as well! That’s nice! I’m sure they enjoyed it. 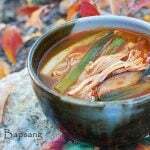 They should also try Chucheon dakgalbi (http://www.koreanbapsang.com/2014/11/dak-galbi.html). You have a great weekend too! Thank you for your recommendation! I almost forgot about that dish. I first had it while I was an exchange student in Seoul 4 years ago. Hmm I’m going to make some next week! My family went to a restaurant in Myeongdong that serves Andong Jimdak today but they did not enjoy it because the restaurant changed their recipe and it was much, much spicer than it used to be. Tomorrow I’m going to make some Galbitang using your recipe (it’s a national holiday here in Hong Kong), I’ll let you know how it goes! Ah I made a typo, should be Hyosun-ssi. Sorry! Hi Hyosun, I made this dish tonight for my family and the flavor was so wonderful! Thank you for your spot on recipe. I didn’t use the peppers since I was feeding young ones, but I had Japanese nanami togarashi to sprinkle to taste for my husband and myself because we like a bit of an extra kick. Also, I used chicken drumsticks only since this is what was on sale and I just used a small knife to pierce the thick parts of the leg and it helped infuse the flavor into the chicken and was very tender. We will definitely be making this again! Hi Anna – So happy to hear it turned out well for you. Drumsticks are always good. Thank you so much for taking the time to leave me the feedback! Hi! I have all the ingredients but the glass noodle. Any suggestion on what I can substitute with? You can simply omit it, or add some other types of noodles (cooked). Enjoy! Thank you so much for sharing your un-intimidating recipes. 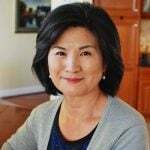 I’m a second generation Korean-American in New York, father of 2 young ones. They LOVE this dish. I’ve made it both without a starch, and with noodles included. I don’t cook much, and whenever I’ve tried other online recipes, results have been discouraging (some really bad Chicken Marsala, oof). But every single recipe I’ve tried here has been at least good, sometimes a real hit. You have a real talent for making these great dishes accessible. Thanks again and please keep sharing! Can you make this using Instapot or pressure cooker? If yes, what would the time be? Yes! In fact, I have a similar chicken recipe made in the Instant Pot which you can use as a reference. Can I use instant pot to cook this? Hi! How would you suggest I adjust thebrecipe to make it less spicy for my children to eat? Hi Jen! See my write up under “Jjimdak Variations” and also the ingredient list. Basically, you can omit or reduce the amount of chili peppers for a mild version. I have made this a few times and it is delicious! My wife is not a fan of overly spicy food but a mild version of this is one of her favourites. She especially likes the texure of the dangmyeon noodles. Thanks for the recipe! I don’t see in the instructions when to add the ginger and garlic? Can’t wait to try this!! Oops sorry about that. Fixed. Enjoy!